On Monday, Mr. Bratton, surrounded by much of his top leadership, delved into the details of his plan. Every officer would go through a three-day retraining course, on how to talk to an “uncooperative person” in a way that does not escalate into a physical conflict; how to subdue a suspect if the encounter does escalate or if a suspect resists arrest; and how to be sensitive to cultural differences. It would also include a leadership workshop called Blue Courage. Mr. Bratton said that officers would be expected to retrain regularly in these techniques, as they do with the use of firearms, and that the course would most likely evolve over time. New York City Mayor-elect Bill de Blasio announced that William Bratton will again serve as police commissioner. He replaces Raymond Kelly, who served since 2002. Good move by de Blasio. Bill is a strong believer in constitutional rights. 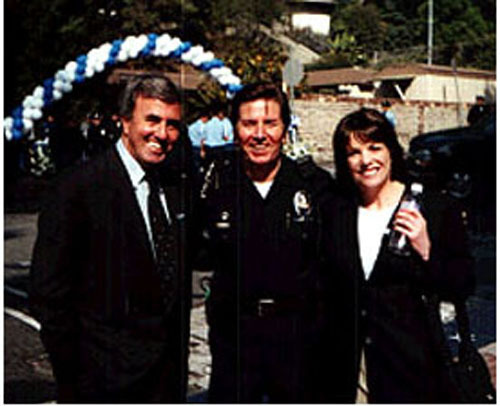 I attended his swearing-in ceremony in Los Angeles in 2002 -- here's my report. After 7 years as L.A. Police Chief, Bill Bratton today announced he's stepping down in October to take a job with a private security firm. Bratton will "reunite" with Michael Cherkasky. Cherkasky and Bratton have been close associates. Before becoming chief, Bratton worked as a consultant for Cherkasky, advising governments in several countries on how to reform and build modern police forces. Los Angeles is weighing an exemption from term limits for Police Chief Bill Bratton. Removing the terms limits would require voter approval and revise one aspect of the police reforms that stemmed from the 1991 beating of Rodney G. King, which sparked riots when four LAPD officers were initially acquitted of brutality. Those reforms limited the police chief to two five-year terms. All of my coverage of Chief Bratton's tenure as LA Police Chief is here. I hope he gets another term. L.A. Police Chief Bill Bratton and his wife Rikki Klieman (former Court TV anchor and a good friend of mine) have pulled out their checkbook and donated to the group fighting the effort to ban gay marriage on the November ballot in California. "The Constitution guarantees life, liberty and the pursuit of happiness," Bratton said this week. "I see no reason why gays can't pursue happiness through marriage." The donation came about when their friends, celebrity publicist Howard Bragman and his longtime partner, Chuck O'Donnell, told them they were getting married. Bill and Rikki asked what they'd like as a gift. Bragman was direct: No gifts -- instead, make a donation to Equality California to help stop Prop. 8. And please make it public. All of TalkLeft's coverage of Bill Bratton is assembled here. In 2002, I attended his swearing in ceremony in L.A. and wrote this lengthy report.